Searching for a receipt number in Outlook does not display anything although, it works when in Safe mode. Browse to C:\Program Files (x86). In the Search box, type SCANPST.EXE. Notes: If the search doesn't find SCANPST.EXE in one folder, try searching in the other folder mentioned in step 1. Navigate to the folder location based on your version of Outlook. In the Enter the name of the file you want to scan box, enter the name of the .pst file you want the tool to check, or choose Browse to select the file. 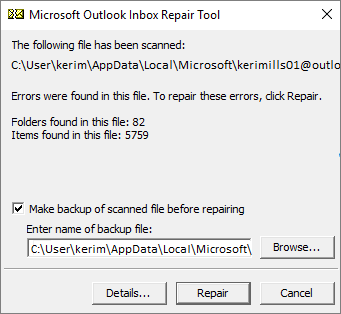 Note: The scan creates a backup file during the repair process. To change the default name or location of this backup file, in the Enter name of backup file box, enter a new name, or choose Browse to select the file you want to use. You can create a new Outlook Data File and drag the items in the Lost and Found folder into the new data file. After you've moved all the items, you can remove the Recovered Personal Folders (.pst) file, including the Lost and Found folder. Mouse 2 dollar ali-express mouse! It is the best ever! Hard Drives Too many to list! Is there a max number of addresses in a single Outlook '07 e-mail? Live.com Slow receipt of email and Outlook error.